The S&P 500 managed to post a quintuplet of five, straight wins this week despite Trump’s announcement on Friday that he now intends to move forward on $200 billion in new tariffs on Chinese goods. The announcement came in the wake of news from earlier in the week that the U.S. would reinitiate stalled trade talks with Beijing in order to resolve their months-long trade dispute. The mere prospect that talks were resuming had been enough to drive markets higher, which was complemented by weaker than expected inflation reports that showed a softening in price pressure for producers and consumers. Friday’s retail sales figure, however, failed to give investors much to cheer about by coming in softer than expected in August. The five-day winning streak looked at risk, but bulls squeaked out a fractional gain at Friday’s closing bell, posting the weekly tally for the S&P 500 at a 1.16% gain. Despite the back-to-school shopping season being in full swing, retail sales barely managed to eke out a 0.10% gain in August, their smallest gain in six months. Core retail sales, which exclude automobiles, gasoline, building materials and food services, also rose just 0.10%, down from a 0.80% rise in July. Top-line results were pressured by a -1.70% decline in clothing stores, a -0.80% drop in auto sales, and a -0.30% decline in furniture store sales. That served to more than offset a 1.70% rise in receipts at gas service stations, which was driven largely by the rise in gasoline prices. Restaurants and bars also only managed to post a 0.20% rise. The August miss is not as disappointing as it otherwise might have been, however, given that consumers front loaded their purchases by taking advantage of retailers’ July back-to-school deals in competition with Amazon’s Prime Day. The upward revision to July’s report to a 0.70% gain from a previously reported 0.50% gain reinforces that. In addition, year-over-year, retail sales are up a robust 6.60%. Consumers look to be well positioned for the holiday shopping season, supported by annual wage growth that hit a nine-year high in August. In an unexpected move, producer prices fell -0.10% in August, missing expectations for a 0.20% gain. That comes on the heels of no change in producer prices in July. August’s decline was the first monthly decline since February 2017. Year-over-year, producer prices were up 2.80% in August. That was a marked slowdown from July’s 3.30% increase. Declines in food prices and a range of trade services served to offset a rise in the cost of energy products. Wholesale food prices fell -0.60% in August, pulled down by sharp declines in the cost of eggs, fresh fruit and melons. Meanwhile, wholesale energy prices rose 0.40%, with gasoline prices increasing 0.60%. The cost of services proved to be the most-watched figure for traders, falling -0.10% for the month. It was driven by a -0.90% decline in the index for trade services, which measures changes in margins received by wholesalers and retailers. Over 80% of the decline in the cost of services was due to lower margins for machines and equipment wholesaling, which fell -1.70%. Declining margins at machinery and equipment businesses suggest producers have not been able to pass on much of the rising input costs related to recent tariffs. That is welcome news to consumers, which should help keep a lid on prices. Consumer prices notched a 0.20% increase in August, missing expectations for a 0.30% rise. More encouraging, prices were up just 2.70% year-over-year. That was down from last month’s 2.90% year-over-year rise. Consumer prices rose less than expected as increases in gasoline prices and rents were offset by declines in healthcare and apparel costs. Core consumer prices, which exclude volatile food and energy components, were up 0.10% for the month. On an annualized basis, core consumer prices rose 2.20%, easing from July’s 2.40% increase. Consumer prices are poised for further moderation as a decline in producer prices trickles down to consumers. Weaker than expected inflation numbers were cheered by investors this week, easing concerns inflation is accelerating faster than expected, prompting the Federal Reserve to accelerate its pace of rate hikes. Despite the softer than expected inflation data, the central bank is still on track to hike rates later this month as the economy remains strong and wage growth remains healthy. A strong jobs market, combined with higher wages and a slowdown in inflation growth suggest the economy remains in its sweet spot and consumers are well positioned to accelerate their spending for the upcoming holiday shopping season. It’s a relatively light week for U.S. economic news with reports on housing starts and existing home sales. In overseas news, the Eurozone reports on manufacturing. Identity thieves are finding new ways to target victims and to exploit personal information by stealing Social Security numbers of minors and then using the stolen information to create fake identities, open credit cards, apply for loans, or get medical care or government benefits. Fortunately for parents, a new federal law will go into effect next week that will allow parents and guardians to take steps to protect children from identity theft. The Economic Growth, Regulatory Relief, and Consumer Protection Act will go into effect on September 21, 2018. It will allow parents of children under the age of 16 to freeze a child’s credit file. A credit freeze restricts access to the credit file, making it harder for identity thieves to open new accounts in a child’s name. The legislation was signed into law by President Trump earlier this year. Under this act, every state is required to offer free credit freezes and credit inquiries to parents who want to check their child’s credit. This law also allows for unlimited free credit freezes for adults and will extend fraud alerts from 90 days to a full year. If you are in the military, the law states that all active duty military will receive free electronic credit monitoring. The clean credit history of children combined with the likelihood that a child’s credit history is rarely checked make minors attractive to identity thieves. Equifax, one of the three major credit reporting agencies, recently estimated that identity fraud or theft will affect a staggering one in four children before they turn 18. Last year, more than 1 million U.S. children were victims, resulting in $2.6 billion in losses, according to a study by Javelin Strategy & Research. That same study also found that 66% of child identify theft victims are under the age of eight. A 2011 report from Carnegie Mellon University stated that the rate of identity theft for children is 51% higher than that of adults. Thieves may obtain a child’s Social Security number (SSN) through school forms, tax forms, medical forms, or anywhere the information is stored, including online. Parents are advised to be incredibly cautious about sharing their child’s SSN. Additionally, parents should always inquire whether their child’s SSN is needed and how it will be used, stored, and thrown away. Oftentimes, it is requested but not needed for many circumstances, such as for sports team forms or other activities. Thieves are using a child’s stolen SSN to create a “synthetic identity” by combining real, verifiable information, such as the SSN of a minor who is unlikely to have a credit file, with fictitious information, such as a different date of birth or name. Using an actual SSN “confuses the credit issuers and they think it’s a new person,” says Robert P. Chappell, Jr., a law enforcement professional and author of Child Identity Theft: What Every Parent Needs to Know. 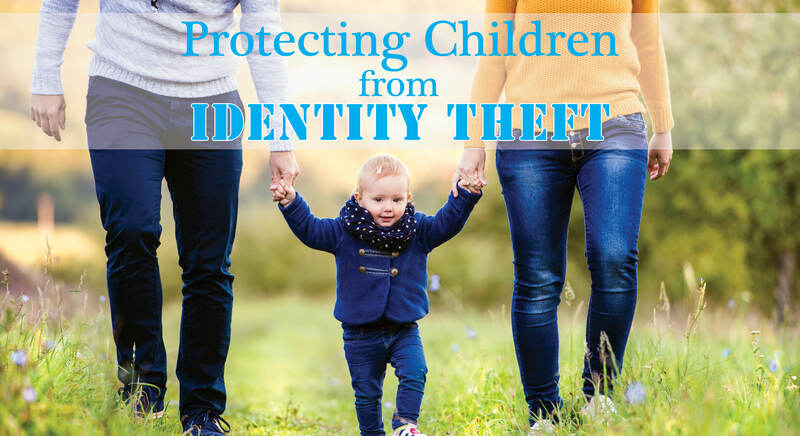 While the frequency and the growth of child identity theft that has been reported is astounding, personal security experts recognize that it may under-represent the real numbers. There is a lack of data on the true volume of identity theft affecting minors, and this is due to several reasons. First, SSNs that are stolen at birth and used for fraudulent activity may go undetected for 18 years or until a child reaches an age where they may begin applying for credit cards or student loans. Second, it is estimated that more than half (60%) of identity theft of a minor is perpetrated by a parent, stepparent, or other relative or family friend. Children may be unlikely to report the theft in these cases. Young children do not have credit files unless parents or guardians have opened them — or someone committing fraud did so. If a child does not have a credit file, parents should check back with the credit reporting agencies on a regular basis. Some experts advise parents to create a new file and freeze it as one option to help protect minors from identity theft. As a result of the new federal law, Equifax, Experian, and TransUnion will each have a web page for requesting fraud alerts and credit freezes. The FTC will also post links to those web pages on its IdentityTheft.gov website with a detailed guide on how to freeze credit files.